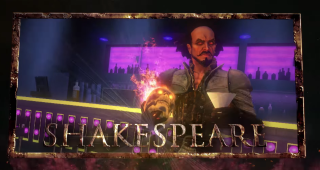 Famed wordsmith, baldy, and legendary comedian William Shakespeare is to star in Saints Row: Gat out of Hell, the standalone expansion to the fourth game that's both free and very cheap on Steam for the next 10 hours or so. Look, there he is in the above, infomercial-style trailer, along with his bessie mates Blackbeard and Vlad the Impaler. Gat out of Hell releases next week, on the 20th, alongside an upgrade of Saints Row IV for the PS4 and Xbox One. Not that you need that, of course—you can pick up IV and all its DLC (minus Gat) on Steam for peanuts. Richard Cobbett wrote about Saints Row's marvellous reinvention for his Critical Paths column yesterday.